123Pet Cloud Edition starts at just $29/month. 123Pet Groom Reviews Recently Reviewed! Pros: It's really easy to use and not that hard to figure out. Cons: The one unique thing I need is the ability to create a long term boarding ticket that allows me to go back to it and add payments into it and show the date and amount paid and it deducts it from the amount owed. Not a subscription type or monthly thing like say Massage Envy does. And it's nor a prepaid service. Example I currently have going on... I'm boarding a dog and have been for 5 months (for a veterinarian getting her house) I wanted to set up the long term all at once. She agreed to a certain amount each month. Paid by-weekly, usually. And we add in a bag of food to the ticket when needed and she pays that too. I need something where I can do that type of thing and it send her a courtesy reminder that a payment is due and what date and the amount. And would be really wonderful if there was a link on it for her to make a payment right then and it logs it to my system automatically. Then sends her a paid invoice for the payment. It's a situation I've seen before in a Kennel situation and I think would be beneficial in the future. I know I'll need it again. Overall: Rep called to check up on me and let me know rep had moved up and he was there to help anytime I needed it. The staff in all areas are just wonderful. Everyone has always listened to what's going on and has directed me in what to do. They have taken my suggestions down for things that would help my unique situation and given me a process to use until new features come out to get things done. I looked a several different types of software but yours, hands down, is the best! I love it. It let's me do everything I need to in all the areas of my business. Thank you for creating such a wonderful system. Can't wait to see how you improve things. Recommendations to other buyers: In my situation I'm in a rural area and hard wired Internet is not always possible nor is it fast or affordable. I use my Hotspot. Therefore I can't use the mobile features I'd like to. It would be cool if you could come up with a way for me to use it remotely, like making appointments and such, and when I'm back with Hotspot on it automatically loads what I did. Not sure how that works but just a thought. It's polished but flawed-obviously not created with input from the grooming world. Overall: We are a medium volume, upscale grooming salon with six employees. 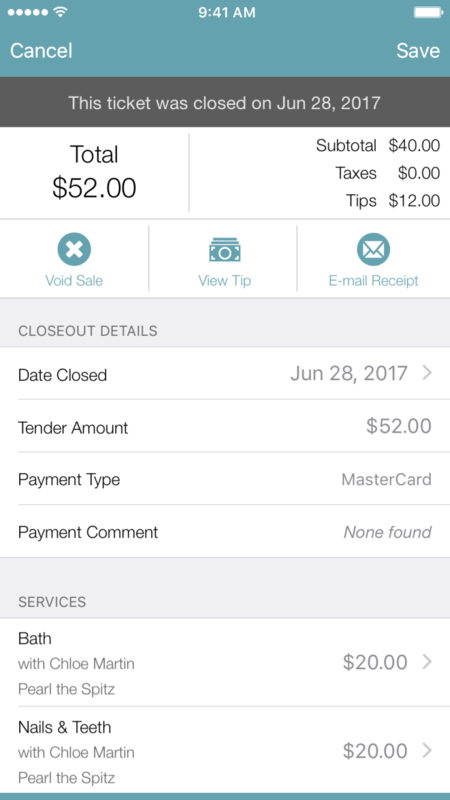 When we opened four years ago, we computerized the clip card client list of an old salon. They have decent customer support and It's fairly easy to use, but there are some very frustrating "quirks" that should have been addressed in updates years ago. 1. Like many salons, we have a number of dogs that drop off at the same time in the morning. The calendar does not allow the schedule to reflect this and creates confusion. 2. Everyday we have at least one client with multiple pets, but if they are assigned to two different groomers, you are unable to drag and drop the appointment. Also, it won't let you schedule them for the same time slot. 3. Because the SMS appointment reminders automatically use the time scheduled on the calendar and not the actual time the client drops off, this feature is useless. 3. There's no third party pos integration, therefore we must keep two sales registers and reconcile them daily. 5. Ditto for the QuickBooks "integration" that is not included in the monthly price. Pros: Easy to use and to set up. GREAT customer service! Cons: Their partner company, Open Edge. Rates are outrageous, customer care lacks immensely. Overall: Ive been a client for 11 years! I have a salon location as well as a mobile grooming salon! The software in salon is very easy to use and helps keep us organized. They have continually improved over the years. I tried using the mobile swiper for my mobile grooming side and had nothing but issues. That however is run through their partner company, Open Edge. I have always received great customer care when calling 123 Pet and we like the software! I would recommend it. I was hoping to recommend the mobile swiper as well but would advice others to go with an Apple Square reader instead. I really appreciate the help I got from Annie throughout the past week while trying to get my problem resolved. She was very easy to talk to and helped me communicate with Open Edge. THANK YOU SO MUCH ANNIE! Recommendations to other buyers: We love 123 Pet! Hoping for better merchant rates or other company options other than Open Edge in the future. We would LOVE 123 Pet to make a reliable mobile swiper! The more they update the worse it gets! Cons: Most of our customers have standing reservations for daycare and also buy packages. You can no longer schedule out their reservations and pull from their package. It counts future dates against the package so you cannot add an additional day if requested and pull from the package. It charges them full price and there is no way to change it unless you start deleting future days and then it just becomes a nightmare. Scheduling is the main function of this software and it does not do what it needs to do to run a successful daycare! 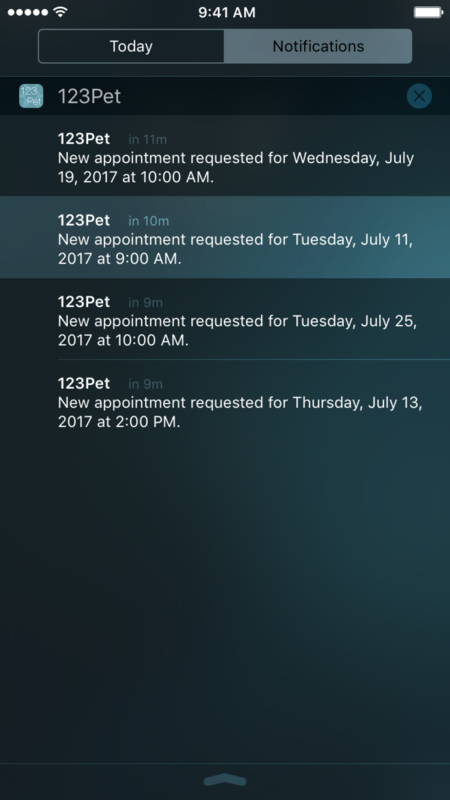 So now we have to manually re-enter every single appointment every single day (over 60 dogs/appointments per day). What used to take 15 minutes now takes over one hour. Now this week it suddenly is showing that customers have negative days so it is no longer alerting us that the customer has used up their package and are due for a new one! That is money out the door!! Also, basic things like viewing tickets used to be so easy and now you have to make numerous clicks just to get to what you want to view. Even though we just paid for an upgrade, we are researching other software companies and are willing to pay again for one that works. The stress of switching over to a new software program is worth not having to deal with the every day stress of 123 Pet! We have been using this software longer than their reps have worked there and know more about it than they do, so they're of no help. We do not recommend this product, look elsewhere! We' sorry to hear that you've had a problem. It does look like you have not completed the free maintenance updates released for your version. These include bug fixes and feature improvements. We did make changes to the way packages are implemented due to many requests. We're sorry that this change negatively impacted your operation. Our Customer Support Specialist has reached out to you to see how we can be of further assistance. Pros: 123 Pet makes my life as a groomer so much easier. It has so many options for recording important info that I need on a daily basis. It also has texting and email reminders and marketing options which save me so much time since I don't have to manually call people. I also really love the new text ready for pick up feature. It has been a lifesaver! Cons: Some of the information pages could be condensed so you don't have to click around as much to look for things. Overall: Overall I great way for groomers to keep track of info and communicate with their clients. Has so many helpful features and they are always improving. 123Pet is the only software that fits our business model of grooming, boarding and retail. Pros: Pretty user friendly. Really works well for the retail end of our business. We really like that the system automatically sends out appointment reminders. Cons: Reports are really hard to create. You can't look up the sales for just one item. The thing that bugs me the most is that I can't get the schedule on my phone. I have downloaded the app, but there are so many changes required for how we book appointments that it just doesn't work for us. At least I am paying extra for that!! Overall: It's the only software that addresses all of our business needs. Clear and easy to use. Pros: All inclusive features you can use or not as you want. We went from csrds doing grooming only to booking weeks in advance, redused canceled or missed appointments, and now we sell products also. Pros: 123Pet software is an absolute must for any animal related business, we currently use it at our dog grooming business and it has taken a huge load off of filing paper forms for every client, of which there are 900+. The software is easy to use and does a great job of keeping things organized. Cons: 123Pet Software is constantly laggy and sometimes completely unresponsive which can be extremely annoying during the busiest part of the day when I have 5 clients trying to drop off their dogs for grooming and the system is not helping. Other than that huge issue I have no complains with the software. Overall: 123Pet Software gets the job done but can get extremely laggy even with a good computer and internet connection, but if you can look past that its a wonderful tool for any animal service business while not being overpriced. Pros: I like the app, you can look at your schedule and make changes if need be or pretty much do most of what you can do on the computer software. This software eliminates the need for anything else organizational-wise at work. You can figure payroll, schedules, commissions, proficiency, send reminders, etc. Cons: The app is very slow if you are trying to reschedule a client. Overall: There are no real problems. I love this software! Pros: I love the convenience of having the software work with the app. I also appreciate the convenience of the text and email reminders. Cons: Occasionally I'll have somebody's email show as invalid when the email address given is a regularly used email. Overall: The convenience of having all my customers organized in one software program that communicates with an app. The fact that I can make appointment seven days a week and look at my schedule anytime I want is an excellent convenience! Overall: He called me to inform me of the survives that this program can provide for my business. The text option to remind my clients of appointments i did not know i pay for that in my package. So he helped me set that up, awesome. also we talked about email reminders that i opted out of. we also set up my phone for mobile trial for 30 days. also we set a date for him call me in 2 weeks to check on how things are going. I greatly appreciate that. very Nice to talk and work with thank you. Pros: It has all of the functionalitty we need to run a grooming and retail business simultaneously. My customers really appreciate the email reminders for their grooming appts. I'm mobile and it been working good for me. Pros: I like the mobile app. I like the easy to use system, it's simple. I like the auto messages and emails. Cons: I wish it was made for mobile groomers. I believe you guys are getting closer to accomplishing that. Overall: My customers are easy to file and I can add info on the go. I've been able to keep track of the history of appointment and payments. 123Pet is easy to use, and with all of the functions, it has eliminated the need for other software. Pros: The automatic reminder texts have been a god send. It eliminates having to call ourselves, which saves so much time! Cons: The newsletter feature is very difficult and inconvenient to use. When setting up a newsletter to send out, if we also need to set up an appointment, or do anything else with 123Pet, we have to do a bunch of things in order to close out to open what ever else we need. 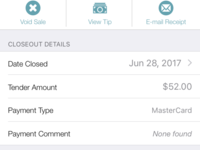 Overall: Peace of mind, time saver, makes everything about running a business so much easier! Pros: I like this software and it is easy to use and fairly inexpensive. The grooming appointment book is easy to use from my phone. Cons: I would like to be able to review my boarding appointments and make boarding appointments from my phone. It can't be reviewed easily right now. 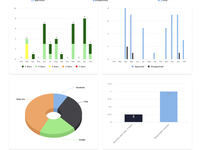 Pros: This software covers all aspects of our business (boarding, grooming, and retail), and is fairly easy to navigate. Cons: Customizing the free website included in our subscription has been a bit of a challenge. Pros: This look of the site is amazing and ease of use for salon is great. Cons: Unfortunately this system will add clients as new client to existing database if the client doesn't put in the exact same information that is in the database already , causing groomer to have to search through database for notes on pet and causing false reports. Giving clients their own code to input instead of all their info would help this. Also, Clients with multiple pets have a difficult time booking as the "plus" sign is small. Should add "additional pet" button allowing for that pets name and service to be added. If that client has 6 dogs but only wants to book for 2, the salon has no idea which pets they are booking for. I spent 30 minutes every morning trying to fix clients appointments. :( Also, overbooking large dogs was a problem. Having a limit amount for groomers to accept would be nice. I just had to add "large dogs must be booked by phone"
Excellent product but could be easier to use. Pros: The software supports allot of features and is quite easy to use. I love the abiltily to customise to suit what we need. Overall: customer service is awesome and they help with any issue you have. Pros: This used to be such a great program, however, recently it has gone downhill tremendously. I'm not sure if it's change in management or something, but a lot has changed and it hasn't been positive changes. I am required to upgrade my version again or else they are going to stop supporting it, so I've been looking elsewhere. Cons: The remote access is always down. The support staff isn't very helpful. I have been paying for support for the past 3 years and they haven't really answered any of my questions. They are adding features, but they never seem to work. Also, I never know how much my bill is really going to be that month. Overall: It used to be a great program 5 years ago, but I can't really say the same anymore. I tried their cloud version recently, but that was a nightmare. Comments: We went totally computerized 3rd Qtr 2010 with 123Pet. We have 3 computer locations with the POS package. Our 2000 sq ft shop is predominately pet and supply retail sales with grooming available. Over time, we have had our doubts over the accuracy of the 123Pet program when used for retail sales, inventory etc. In particular, when the year end inventory matches exactly with the pre and post inventory count, I have my doubts. We need to up grade something here now, as the computer system we purchased in 2010 was shipped with Windows XP, which as you know is no longer supported. I am frightened beyond words when I see the current 123Pet pricing schedule and the additional prospect of having to purchase 3 computers in addition to the 123Pet software. I only have 4 employees but to have payroll and 3 computers in our shop, 123Pet wants us to have the second from the top tier software program. Now don't get me wrong, 123Pet has taken good care of us over the years, I'm just concerned about the wisdom of going forward with them again. Are we best suited to be business partners? Hi Mike! A member of our team will be reaching out to you shortly to address your concerns. Thank you. Overall: The list is too long, and I don't have time because I am trying to fix this systems disastrous mess it's created with no help from 123 pet at all, but many wasted hours discussing the problems over and over again with tech support (which you have to pay extra for, and have to explain the problem over and over again to different staff). The system worked "ok" when we were small, but now, it's an absolute joke. PS, if you're considering this for it's ability to connect to Quick Books, DON'T!!!!!!!!!!!! Your better off manually entering everything. Recommendations to other buyers: Don't bother with it, you'll regret it if you plan to grow your business. Pros: It's very easy to search for pets and owners, it's easy to check dog's notes as well as check out, and it functions pretty easily overall. Cons: There isn't a lot that I dislike about it. The only thing is that sometimes if the days are too long it's a little hard to book dogs as it won't let you scroll all the way down. Does the job we need it to do. Cons: It's hard to master and the online training videos are poor quality so it's hard to teach employees. Was disappointed that I couldn't modify the email message going out to customers who book online. Was able to modify our replies but not the initial one. The company is in Quebec Canada and we are obligated to have everything in French. We can send bilingual but only English could get us fined. Just taking a chance now. Comments: This is a hair salon industry product trying to apply to the pet care industry. 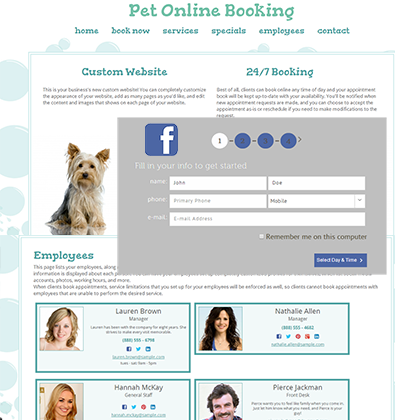 It is is impossible to use for quick and easy reservations for grooming, boarding and daycare. Check-in/check-out for products and services must be done by assigned groomer or handler. So if you have multiple services and locations, scheduling must still be done by the handler or groomer or by source. 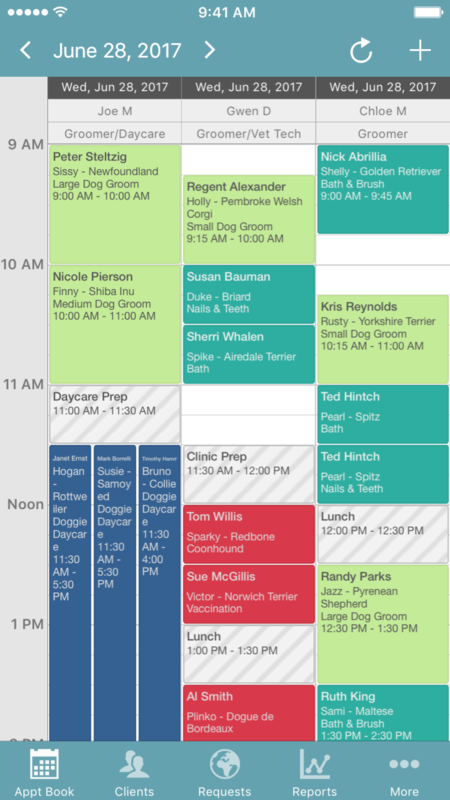 Scheduling by source (boarding, grooming, etc.) is a problem because you can't allocate resources at check-out. For example, if you had a pet board and a groom, you can't easily distinguish the two at check-out to give your groomer commission, you have to go back and still create the appointment for the groomer! Advertised features are actually "add-ons" for additional fees, $5.00 for 1000 emails, 10 cents for every text message, fee for remote access, etc. Customer service was always a wait and repeatedly had to leave messages. While we did receive callbacks, it was very frustrating because we couldn't get immediate answers and it further delayed our conversion. The sales staff encourages you to sign-up immediately because the 30 day free trial will not give you full access to all of the features of the program. And in fact, the program offers a 30-day return, but it takes longer than 30 days to convert to full use. When I cancelled the service, the sales staff was very nasty. No one asked what they could do to remedy my concerns and keep me as a customer. Furthermore, I called two days after a new billing cycle and they refused to refund my money. They told me that I should have cancelled within the first 30 days. 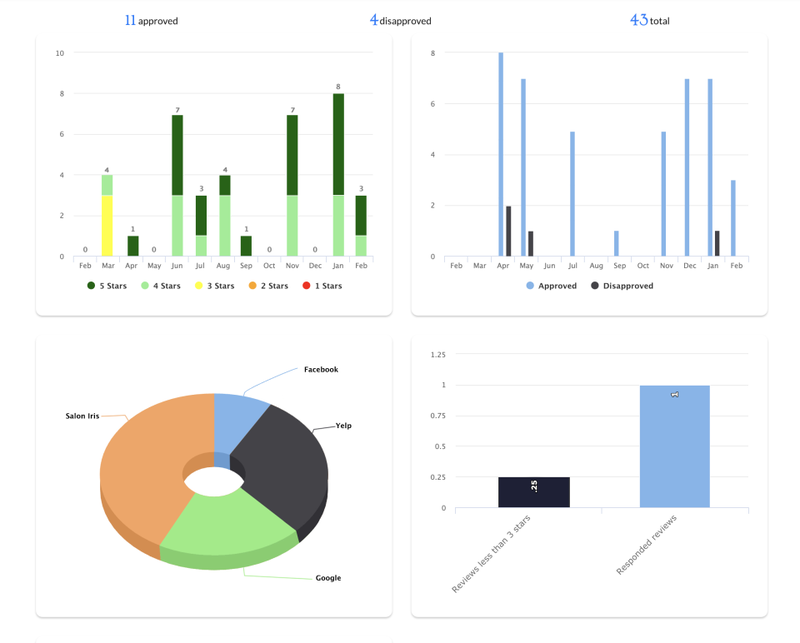 If you believe that you can tell a lot about a company in their behavior when you have difficulty or a complaint, then believe that 123Pet Software does not care about the end user's success or experience with their product. Overall: Staffs being very helpful. And the program is easy to use. A lot of functions, cover for grooming and retail. Recommendations to other buyers: We should be able to manage the report ourselves. Pros: The marketing part for email campaigns was good. Automatic reminder feature too. Cons: It's over complicated and hard to learn to navigate through. Missing key reports. Cost was high but customer service was good. Overall: I liked using this software but there are now new ones available that do the job better and at a lower price. Thanks for the review Ryan. In fact, credit cards can be stored within 123pet groom for taking deposits or for charging for no shows. You should contact our Sales or Support teams for more information on getting started with this. Overall: As others have noted, 123Pet's Customer Support team is AMAZING. You get free support/training with your subscription and that was integral to getting our shop up and running quickly. 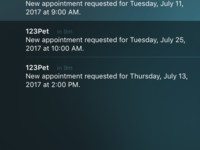 Robust app with lots of options for saving pet details (notes, photos) and the scheduling (and online booking) is what makes this worth the money. The software is lacking in critical functionality and is deficient in many aspects. Pros: The customer support staff is wonderful and extremely knowledgeable. Unfortunately, the software cons by far outweigh the pros. Simply put the product appears to be a shelled version of the salon software, neglecting the operational considerations of a dog facility. Cons: Can not book a multi-day service, only integrates with a desktop version of QB, general journal entries cause duplicate entries, employee service limitations, reports are limited, the time limit on services, no supplemental tracking of other costs associated with a dog facility, OpenEdge integration is great in theory but in practice is horrible. I have lost revenues exceeding a reasonable level, can not process sales from client computers, the networking is dependent on a third party platform, there are several additional items deserving consideration, perhaps I can elaborate more at some point. Horrible software...threw my money away. Comments: The number of errors and crashes that come with this program are embarrassing....clearly just threw away my money. 3)Pre-paid Services creates massive accounting flaw. If a client has 1 prepaid service but wishes to book for more than 1 service in advance the software understands all services booked as paid (beyond the 1 they have prepaid). I commonly book regular clients in advance (they come every week for a year - i want to be able to book them for the year) but the software recognizes all 52 bookings as paid for if the client has a little as 1 prepaid service on their account. Cost me a whole lot of money before i realized the software was giving my services away for free....that was a fun discovery. 5) Customer service - abominable. 6) Software constantly crashes and errors. I will get at a minimum 1 crash per work day. Worst purchase ever - Stay away! Comments: Where to start... Too many negatives to list but allow me to share the most disturbing ones. When switching out computers I was informed that I needed my product key that was emailed to me approximately 6 months ago. I have every email from Daysmart but not this email they insist I have... So, if I want to ever use the software I paid almost $800 just 6 months ago they tell me I need to pay them $99 for key retrieval or $120 for software support and they will get me my key for free. Can someone say extortion? Let's just say that I'm no longer using their software and going to go with another company and seek remedy through the courts. Stay away from this company and their product! It isn't easy to use, they auto set up $60 a month support fee (after 3 months free so you don't even think about checking for it - thankfully I scrutinize over my checking account and saw this fee). Their sales literature touts email reminders for clients and other services; well, be ready to pay a bunch of money each month to use them! $9 a month remote access... couldn't even see the entire calendar for the shop to include all groomers. Email clients, that'll be $5 a month. Booking online, that's going to set you back $29 a month. POS software solution... not even close. Pros: It's slow and old fashion.not up to date .Moe go is a better service and such better service.They actually listen to there clients. Cons: It's slow and old fashion.not up to date .Moe go is a better service and such better service.They actually listen to there clients. Overall: Awful they don't respect small business and will take of advantage of auto pay and don't refund you and they would rather take your money then the care of a client happiness .Use MoeGo instead .More efficient and they don't take advantage of you. 123 Pet Software made running my grooming salon easy as pie!! Pros: Everything is self explanatory and laid out for you. It is a roadmap of success! Cons: No availability on weekends! Overall: Customer support was great! Regardless if the question, whether it was simple or difficult, they answered and explained in a way that put me at ease. Recommendations to other buyers: If you are in the grooming business and want to be successful, you need this software! Comments: I have tried gingr, petexec and dogbizpro. Petexec people were frenetic and difficult to work with. I left them after a second training. Gingr is a start up and though they say they are offering a lot of functionality they do not have it ready. Their training is overbooked and unorganized. When I had a question I had to wait a week to talk to someone - had to book an appointment! They also charged me $300 to import my clients - insane! I don't have an overall rating yet as I haven't used the software on my programs yet. More to come but so far set up was fast and lovely! Comments: Web based version doesn't show days of the week on the calendar. Makes everything confusing. Notes/comments don't match the same categories as the app. Can rebook from web but not through app. When you add a new customer through app it doesn't select to send reminders (almost lost me $300!) Comments written in the receipt do NOT show up on the receipt. The receipts are sent by an unmanned email so if your customer happens to email you via the receipt you will never know until they are mad because you never responded. They upgraded the app login screen to be SO confusing I shouldn't need to constantly have to skip the intro trying to sell me the product, and shouldn't have to keep choosing that I am already registered. Extra steps are time consuming. Works 80% of the time - mornings seem to be the worst. This is my last month and then I am just using |Google calendar with Apptoto for reminders - MUCH cheaper and it'll work without data on my phone! Hi Sanya, thank you for leaving your feedback. We hear your concern, and will be following up soon to address the issues described. Thank you for your patience. Overall: So far the program is excellent and everyone at customer support is extremely helpful. It's doing almost everything I expected and more . The transition from my old software to this program has been much easier than I expected . Pros: I am so happy to be so organized now. So much easier to keep track of clients and all of our products. Able to get help when ever we need it. Hi Neinda. Thank you for taking the time to give us a review. We are here to help you get the most out of our product. Please feel free to contact us, and visit blog and support center for additional information. We are here to help! Comments: I had to call customer support today for the first time in two years having run 123Pet software with no problem for the entire time I've been in business. Their customer support team was courteous, quick, and extremely helpful. I am very glad that I purchased the monthly subscription package to add a second terminal, and I am delighted that the support team is so helpful! Pros: I liked most that they personalized the app for pet caring working. I like mostly that in some way they made me identify myself and in seconds I already was adapted to the platiform and its features. Overall: I love that I have my work schedule in a very quick second and also I have had excellent customer support. Comments: I wrote a long one and it got wiped. It was good too. In a nut shell, Support team makes me feel like I am calling family. Customers love their reminders. Business is growiing and even though I feel I can't afford this system, I can't not afford to be without it. One day I will have time to learn to market with it. Comments: I have been using this software for the last several years. I have recently upgraded to the monthly subscription and I'm so glad that I have done so. I cannot imagine running my business without this program. The costumer service is great, friendly and very willing to help. Thank you Duston!! Comments: I cannot give enough praise to Dustin whom I spoke with this morning. He asked me what I needed and completely went above and beyond my expectation. I have always received top notch customer service with this company. They are always improving. Started with them in "07". Outstanding product with even more outstanding sales peeps! 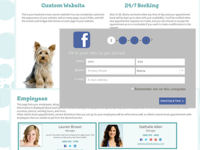 Comments: 123 Pet is an incredible, all-in-one software package for ANYONE in the pet care industry. I was VERY impressed with my salesman, Kevin, and his team, who were extremely polite and professional and answered all of my dumb questions!